If you would like us to add a particular Crystal Click Here and be sure to tell us what Crystal you would like adding, we will do our best to get this on at our earliest convenience. Use this Guide by either clicking on the name of the Crystal, clicking "next" or "previous" to see images in order, you can click the Crystal picture to see the next Crystal or you can click "Play" to see a slideshow of the crystals in this guide. 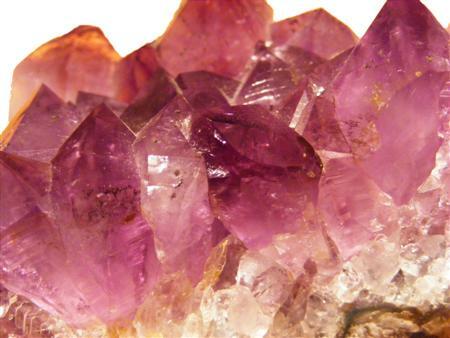 Amethyst is one of the most popular of crystals. It is often the favourite crystal in a collection and the one that introduces people to crystal healing or spiritual pursuits. It's healing properties are renowned and can therefore be used on any part of the body. Although it is most usually associated with the Crown and Third Eye Chakra. One of its many healing attributes is it's ability to relieve pain and tension. Chevron Amethyst is especially good at relieving tension headaches. It works on the pineal gland found in the middle of the brain behind the Third Eye Chakra. It has a calming effect on people who are emotionally erratic and helps with sadness and grief especially with overcoming unhappiness. It also helps us face up to unpleasant experiences encouraging the conscious brain to deal with them rather then tucking them away in the subconscious to fester away. The calming effect on the brain helps to establish a good sleep pattern. It is most beneficial when used long term for these purposes. In Tibet Amethyst is considered sacred to Buddha and has always been regarded as a very spiritual stone by various religions. The purple colour signifies dignity and piousness. Andhydrite, as Angelite is otherwise known, is formed through dehydration of the rock-forming mineral gypsum. The loss of water causes the rock layer to shrink and so mineral specimens are difficult to find and supplies are mainly found in Mexico, Peru and New Mexico. This is just the start, over time we want this to become a Crystal Guide that you can come back to time and time again. Andhydrite was renamed Angelite in 1986 because 'New Age thinkers' found that the high vibration caused by its beautiful pale blue colouring enabled connection to the Angelic Realms and through this connection it unlocks our loving and compassionate nature. When applied to the feet it clears the meridians of blocked energy and can also be used to cleanse the aura and of course attunes us to the Angels. As well as this it also provides peace and tranquillity and enables us to be more focussed and calm. 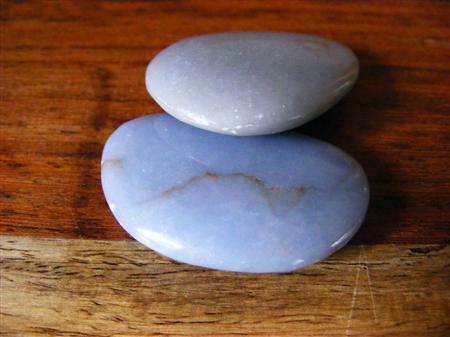 Angelite's connection with the Throat Chakra helps us to heal by calming the muscles of the throat allowing us to say what is being help back because of fear of disclosure. Thus it enables us to speak our truth. It's connection with the Throat Chakra also means it can be used to balance the Thyroid and Parathyroid Glands. 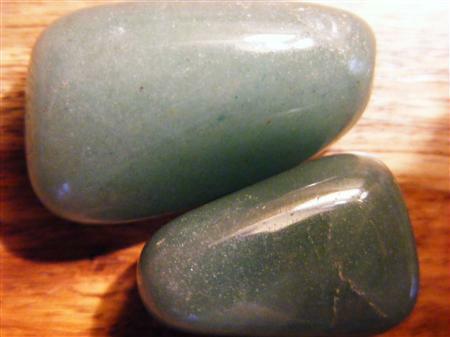 The association of Angelite with truth, honesty and banishing fear also makes it a perfect stone to connect with Archangel Michael. It is also a good stone to use to release physical and psychological pain. The fact that it was formed through dehydration means that it should never be left in water. All colours may be used in crystal healing but green is by far the most important for it's healing properties as a gentle comforter and supporter. It works with the devic kingdom of nature fairies. If you place three pieces in a triangle in your garden it will attract the elementals. 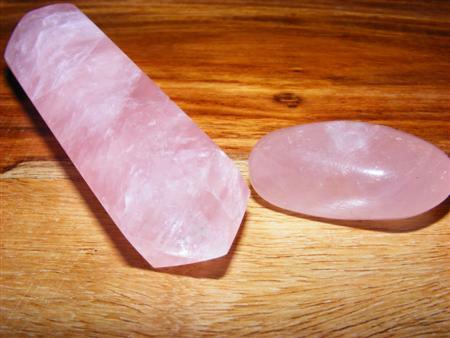 This crystal restores stability to anything malignant by lowering the acceleration of cells which are over productive. It helps biliousness and ridding the body of infections. Moonstone has a beautiful gleaming sheen which catches the light. It has an inherently feminine energy which is bourn out by it�s soft lustrous surface which feels like silk to the touch. Although it�s energy is primarily feminine it can be used to balance out the male/female, yin/yang energies of both sexes. This crystal has always been associated with the Moon and, therefore the cycles of the Moon around the Earth. The Moon brings with it the feminine energies we think of as mysterious, introverted, loving and spiritual. It is one of the most important symbols for women, because, the cycle from full moon to full moon takes 28 days corresponding to the menstrual cycle. Consequently we often refer to the Moon as �she�. She certainly has a big effect on all female reproductive cycles. Moonstones connection with the Moon makes it is a very good crystal to use for problems with the female menstrual cycles, balancing the hormones, fertility and childbirth. The force of the Moon�s gravitational pull is so powerful that it influences all the water on the Earth, and, as our bodies are largely made up of water, it is obvious that it will have a big influence on the way our bodies work. For this reason Moonstones can be used to help to relieve water retention. Moonstones connection to the hormonal system of the body means it has a healing effect on the Pituitary Gland. This gland controls the Endocrine System which affects the secretion and use of the hormones by the body. The position of the Pituitary Gland in the brain behind the Third Eye Chakra and it�s connection to the flow of light into the eyes means that the energy of Moonstones helps with the development of Clairvoyance and connecting with the sixth sense. Selenite is usually formed within ancient sea basins through the evaporation of the water that would have been contained there. As water carries the signature of the energy that is contained within it, (we know this through the development of Homeopathy) it is obvious that Selenite contains ancient knowledge held within it's crystalline structure. This information pertains, therefore, to all knowledge of all time. It is also known as a stone of communication. It's ability to enhance telepathic links makes it extremely good for helping us to receive advice and guidance from our Angels and Guides. The very high vibration of Selenite makes it an excellent stone to use when healing with the Angels. The healing energy of Selenite brings light to every cell of the body. It's memory of the water source it was created in helps it to connect with the water contained within our bodies and especially the spinal fluid. 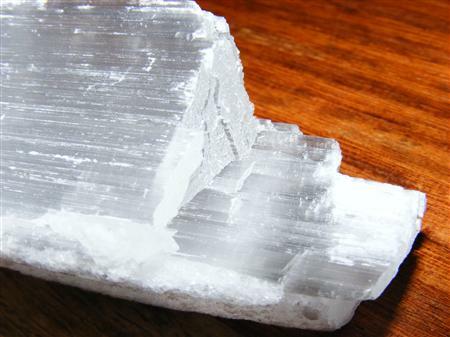 The pure vibration of Selenite makes if an effective cleanser of the auric field. A piece of Selenite gently and slowly brushed through the aura clears congested energies and any negativity that is contained there. It connects and activates the Third Eye, Crown and Soul Star Chakra helping the user to be aware of and connected to the higher planes. Content Coming Very Soon come back again for a full description.